Once there was a boy. Orphaned at an early age, then adopted by his uncle and aunt who lived on a modest little farm in the Palancar Valley, his was an ordinary life. Like the nearby village children he spent much of his time outdoors helping on the farm, tending the garden, or helping with the animals. In his mid teens though, life changed unexpectedly and very dramatically for young Eragon. Chosen and called to become a warrior for his people, his initial response was retreat. He wasn’t worthy. After all, he had no parents, no lineage in the ruling class, no name of his own. Who would follow him? But the call was unmistakable. Branded on the palm of his hand was the insignia and it wouldn’t wash off. Eragon’s journey through four long but excellent novels is a multi-layered story of growing up; both for this not yet grown boy and those who parented him along the way. Woven throughout the series is a supporting theme on the power of names. When parents welcome their firstborn into the world, one of their biggest decisions is ‘what shall we name him or her?’ Naming is a God-like power given to us. God Himself named everything He made until day six when He then bestowed that authority on Adam who in turn named all the animals and also Eve. Naming is the beginning of a relationship, the calling of one person to another. And so Adam shepherded the animals by name and he christened the one of a kind woman with the name Eve. Naming a child is not a trivial matter. Parents usually think long and hard and pray much about their little one knowing the name they give will be theirs for life. To state the obvious, we were made by God for relationships. In the Garden He made us like Himself, in His image, so we contained all that was needed to have a relationship with God Himself; to know and be known, to discover and be discovered, and to become all He intended. Humans have five senses to see, hear, smell, touch and speak to one another. God also created us with cognitive and emotional capacities to be loved and to love in return, so that we can enjoy relationships with others. “…this is the message you have heard from the beginning, that we should love one another” (I John3:11). Even though we know this as parents, this is often the most important life issue not being intentionally proactively addressed. We teach our kids how to behave outwardly, quickly and necessarily correcting inappropriate behavior. But do we purposefully teach and train them how to love biblically and develop relational life skills? Are we calling them to become Nathan the kind hearted, Andrew the brave, Lily the gentle? The family was and still is God’s first and best classroom for learning how to love. Home is where a child can be loved and can learn to love, where he learns that selfishness and love can’t coexist, and where she learns what to do when she hurts others and fails to love well. The name Love is the basis of relationships. A relationship is like a highway with one or more lanes going in each direction. On one side of the median is your initiated love to your child; the lane in the other direction is your child’s response and growth back to you. It’s never too late to start building a stronger relationship bridge with your child, keeping its lanes, entrances, and exits maintained and strong. answer the 1000s of questions asked seemingly every week, or with some kids every day! Now for some how tos! Here are 3 practical ways to start building relational roads and bridges to your child with the result of deepening bonds with one another. 1: Value your child’s uniqueness as a gift from God. One of the most important ways to love to your child’s heart is by receiving him or her with thanksgiving to God over and over again, and by voicing that gratitude in your child’s presence using his or her name. “I’m so thankful God gave you to us, Max. What a delight you are!” Don’t just use their full name when they are in trouble. The Psalms declare, “Behold, children are a heritage, an inheritance, from the Lord, the fruit of the womb a reward,” (Psalm127:3). Loving is easy when they are smiling happy babies, sweetly singing preschoolers, well performing school-aged kids, and successful well-liked teens. And love is always easy when your children are sleeping peacefully and safely at home. Ahhh. Even teens are easy to love when they are asleep! But love isn’t so easy when they cry all night, refuse to get in the car seat, hit at school, don’t try hard enough in middle school, rebel against all your standards, scream and yell at you that you don’t love them, and make life miserable for everyone in the family. We had kids that weren’t easy to love; like the phone call we got from a teacher that one of our teens had been caught cheating in class, or the time one of ours yelled, “You are the meanest parents ever,” or several of ours were just plain unpleasant when they were early teens and thought they were so cool. You choose self-control when you’d rather yell. You choose to tell them you love them every day even when you don’t feel like it. You choose to thank God for your child’s taste preferences, aversion to textures, interest in cooking rather than basketball, and a thousand other surprises you never expected to see in your child. You choose to express affection, aka hugs, holding hands, kisses, etc, when your child acts disinterested because you know it’s important. Even when he pushes back or refuses to hug you in return. You choose to thank God over and over for the gift of this child to you and your family no matter what. Remember God does not make mistakes. If you let your child’s negative actions or behavior stop you from moving forward in love, he is controlling you. The good qualities he needs you to recognize, name, and call out get lost. Eragon learned of a sad event called the Banishing of Names, which resulted in those whose names ceased to be spoken becoming little more than animals. Without names they couldn’t communicate, became isolated and shriveled into useless impotent creatures. It is imperative that you the parent remain more mature, more dependent on God, more prayerful, more committed to loving well than your child. You set the tone, not your child. Pursuit is action. It’s initiative and movement. The demonstration of love is a commitment to pursue, a refusal to quit. Pursuing love finds a way to build a bridge in the middle of a battle, crisis, or impasse. One of the ways that Dennis pursued our children was by dating each one individually. Because he worked full-time and traveled a good bit, he intentionally spent one on one time with our children that he named “dates.” He started dating them when they were four or five years old, so by the time they were teens they had a decade of special times with dad. Roads had been built into their hearts, training had been delivered, calling them up to excellence had been repeated, and reminding them who they were and belonged to was rehearsed. Set an achievable goal of two dates a year per child as a starting place. It’s the simplicity of positive focused time together with purposeful words of affirmation spoken eye to eye that makes it meaningful and unforgettable. For me as a full-time stay-at-home mom who had more time than I sometimes wanted with my kids I chose natural one on one times with them to invest in our relationship: running carpool, driving to lessons, taking them to the orthodontist and other appointments. I tried to make the time intentional by asking questions, going to get lunch after the appointments, finding ways to get to know this one child apart from his siblings. What was hard about your day? Play the ‘highlight and lowlight/best and worst’ part of your day at dinner or as you drive home from piano. Who was kind to you today? Who were you kind to today? Did God show you something new about yourself or someone else today? Both of us also made it a point to name at least one affirming quality a day to each of our children, even if it was just a reminder of our always love. Parents are generous with our corrections, most of which are needed, but our kids need to hear us name what is good, too. With our adopted child we often reminded her, “Ten times out of ten we would choose you all over again!” With our child who experienced a physical disability, we continued to express belief, “We believe God has a great plan for you.” Why? Because, belief keeps hope alive, especially during the teenage years. Many teenagers struggle with self-doubt and wonder if God really does have a plan for their lives, especially when their world is being shaken with all the adjustments of teen years. Name all that you see that is good to help them remember and not lose heart. Young Eragon began a long season of training that continued through the end of the series and in many ways mimics the hard lessons most teens must encounter. His instruction was often more difficult than he expected, more painful and frustrating too because as a teenage boy he often assumed ‘I got this.’ His mentors were not afraid to correct him and simultaneously call him to a higher standard. And they made sure humility was imbedded in everything for understanding ones place under God’s ultimate authority is crucial for all of life. In this way parents are like God to their children. We imitate, demonstrate, and model what God did for us. Over and over and over. In the process we grow a relationship with each child, and our relationship with God grows exponentially deeper as we desperately depend on Him. At the same time our child begins to take baby steps toward her own relationship with the Creator God who formed her as together, parent and child practice giving and receiving forgiveness. Paul writes an invaluable challenge from God in Ephesians 4:32, “Be kind to one another, tenderhearted, forgiving one another, as God in Christ forgave you.” Forgiveness is the bedrock of a relationship. Do our kids, our teens deserve our forgiveness? Many times we feel the answer is no. But God is our model. He refused to let your rejection of Him, your offense of His holy standards, your running away from Him, your decisions to do life your way as if you were smarter than your Creator, stop His Love from pursuing you. When you truly forgive your child, you don’t let his rejection of you, her angry words toward you, or his decision to deliberately disobey stop you from loving and forgiving. You give up the right to be angry and withdraw from him or lash out at him. Forgiveness frees you from being imprisoned in resentment and gives you the confidence to come across the bridge toward him to re-establish and experience a relationship with him. Forgiveness is a choice. Choose to forgive, keep the relationship alive. Conflict is normal even in all families. Homes that don’t have conflict don’t have real relationships with real people. We are ALL broken people, selfish moms, angry dads, and children who are just like them…and so we hurt one another. It’s why true forgiveness is the ultimate maintainer of bridges…God to man and parent to child. Now it’s your turn to put this into practice. Plan a date with your husband, even if it’s an after-the-kids are-in-bed living room date with two cups of decaf or tea. 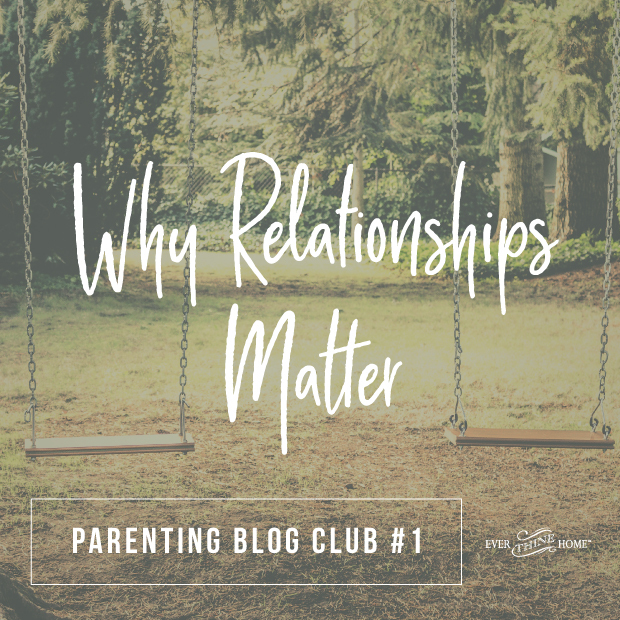 Find even thirty minutes to talk about these questions and how you can improve intentional relationship building with each of your kids. Discuss where your relationship currently stands with each of your children. Are you satisfied with each or do you see room to grow? Which of the three ways noted here is the hardest for you with each child? Which is the easiest with each child? What is one practical way can each of you can commit to build a relationship with each of your children this week? Will it be a little date? Asking a few key questions? Speaking a positive affirmation to each child each day? Help each other follow through with your commitments with gentle reminders and big encouragements when you see each other pursuing your children in the next few days. All these little investments add up over the years. Building a relationship with each of your children will pay off not only now but in the years to come after they leave home and live on their own. this is great!! I love it! I hope is not too late with my 19 yrs old . Thank you so much! Thanks for this. My children are grown. I have grandchildren and great grandchildren who need these reminders and this training.